Mountain Cabin Getaway, Hendersonville, NC. Cabin sleeps 4, Mountain Views, Private deck, Luxury King Bed, Cable TV, Free WIFI. The Cantrell Cottage, a hidden mountain jewel. 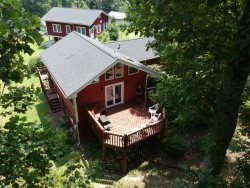 Feel the tranquility of being on top of Cantrell Mountain, in Historic Hendersonville, NC surrounded by the Blue Ridge Mountains, offers King Bed, fire pit and tranquility. This cottage sleeps up to 4, 1 King Size bed, and 1 Sleep Sofa, all in open concept, and 1 large bath. It provides the perfect getaway, surrounded by nature yet all the amenities; well equipped kitchen, Brand New AC units, all linens and towels provided. Close to golfing, hiking trails, downtown Hendersonville. Convenient to Asheville, The Tryon International Equestrian Center, Biltmore Estate, Sierra Nevada Brewery, Wineries, Hiking, Dupont State Forest, Flat Rock Playhouse and dining. Plan your next stay at this cozy, comfortable cottage, relax on the decks, grill up one of your favorites, and listen to the sounds of nature. The kitchen includes a large mini refrigerator, Full-sized stove, Microwave, place settings for 4, coffee maker, a Keurig, toaster, pots and pans, knives. Make yourself at home here! All linens, towels and pillows, comforters all provided. Sit by the fire pit in the private backyard and make s'mores and enjoy the starry nights in the mountains. Or, if hiking or biking is more your thing, head out to explore and discover DuPont Forest (where the Hunger Games were filmed), an easy to moderate hike in to see the glorious waterfalls. Or visit The Carl Sandburg House and climb to the top of Glassy Mountain for the ultimate panoramic Smoky Mountain Views, pat the goats, or take the tour of his Home where he and his family lived. If you are looking for an all day outing, head up to the Pisgah National Forest. Or make a day trip to visit the infamous, spectacular Biltmore Estate. Hendersonville is also home to several vineyards, stop in for a tasting at one of our local vineyards; St. Paul's or Burntshirt Vineyard. Plan to tour Sierra Nevada, the Biltmore Estate, or Zip Line nearby. Check out what shows are in town and see a live production at the NC State Theatre in Flat Rock or downtown Hendersonville. An easy entrance in to your cottage, from the front deck, on ground level, you will enter in to the airy, open concept cottage. Recently updated and remodeled, clean and fresh, tastefully decorated by the owners, its warm and welcoming.Your kitchen table is situated in front of the large picture window overlooking the rolling hills and Blue Ridge mountains. The small kitchen is just the right size to prepare easy meals and your favorite coffee. It boasts granite counter tops, electric stove, large mini refrigerator, microwave, toaster, setting for 4, coffee maker and a Keurig for fresh brewed coffee.The bathroom also has granite vanity, a walk-in shower, large closet for fresh, clean towels provided, and another closet and drawers for your belongings to make you feel right at home. Open up the lovely French Doors to your private, spacious back deck with chairs and small cocktail tables, and a gas grill to cook up one of your favorites. Sip a glass of wine at Sunset or star gaze on a clear night on your front porch. Enjoy your fresh cup of coffee in the morning looking out over the Blue Ridge Mountains. This cabin is perfect for a weekend get away. The cabin was super clean. It has everything you need. Even has some toiletries just in case if you forget something. Bed was comfortable. The cabin is in a very nice secluded neighborhood that isn’t far from hiking, wineries, and restaurants are 10-25 min. away. Downtown Hendersonville is 10 min away. My wife and I loved this cabin and will come back. Cantrell Cottage was perfect for our last minute stay in Hendersonville. The bed was comfortable and the location was peaceful. It's 20 minutes from Bold Rock Cidery in Mills River and a great winery, St. Paul. Hendersonville is a cute town with a lot of shops and great food. We would definitely stay here again! A beautiful and clean house with splendid mountain-view. There is a fully-equipped kitchen in the house and the grill outside, which is great for those who like to cook. I would recommend this cottage for couples. Keurig Coffee Maker, some coffee provided for you! Can't wait too visit again. Please note the larger red house next door is Privately Owned. Please park to the left on the path in to your Cantrell Cottage and respect their privacy as they will respect yours. Thank you. House Rules are on the Welcome Letter on your dining room table. Use only the Small cup on the Keurig for the mugs available for your use. Note: there is no washing machine or dryer here.